Bananas are a delicious fruit that contain vitamins, minerals, nutrients, and plenty of dietary fiber. Eating one or 2 bananas a day can help improve your digestion, lower blood glucose levels, and give you plenty of energy. Bananas also contain dietary fiber and certain starches that can help you lose weight. Most people are familiar with the traditional yellow skinned banana but very few know about the red banana. Red bananas are a type of banana with reddish-purple skin. When ripe, raw red bananas have a flesh that is cream to light pink in color. Red bananas are softer and sweeter than the yellow skinned Cavendish banana, and they have a slight berry like flavor. One medium-sized banana is relatively low in calories and carbs and contains about 17% of your recommended daily intake (RDI) of vitamin C. Consuming 1 banana a day can also help you get potassium, vitamin B6, and 10% of your RDI of fiber. It’s not just the tasty flesh of the banana that has health benefits. Banana peels are also edible and contain antioxidants and antibacterial properties. In fact, banana peel from Cavendish bananas contains high levels of dopamine. In this article, you will find out why red and yellow bananas are so good for you. I will examine what scientific research has revealed as to the many health benefits of regularly eating bananas. At the end of the article, you will find out how to get the health benefits of banana peel in your diet, as well as delicious banana smoothies to boost your health. Bananas are an edible fruit that have a thick skin and grow in tropical warm climates. Bananas belong to the Musa genus of plants. One of the most popular types of banana is the Cavendish banana (Musa acuminate). These are very sweet bananas that usually have a yellow skin. (1) Other types of bananas on sale in supermarkets are Big Michael and Martinique bananas. 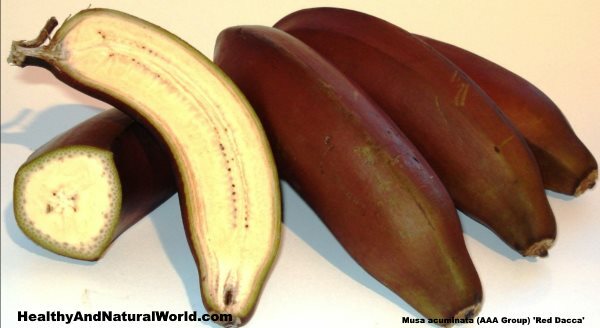 You can also buy red bananas which have a skin that is reddish-purple and are usually sweeter than Cavendish bananas. Another type of banana it the Lady Finger variety which is smaller than regular bananas. Plantains are also a type of banana but have a higher starch content and less sweetness. These are sometimes referred to as “cooking bananas” and can be eaten unripe or ripe. Plantains are usually green even when they have ripened. Bananas are extremely nutritious because they are low in sugar, have a low glycemic index (GI) and contain a number of vitamins and minerals (2) which can help you get your daily recommended intake of essential nutrients. For example, even a small banana contains just 90 calories and 23 g of carbs. The fiber content in a small banana is about 2.6 g which is an impressive 11% of your RDI. So, consuming 2 bananas a day could help you get almost half of your vitamin B6 requirements, over 30% of your vitamin C requirements, and 25% of your needed potassium. Bananas also contain protein. The amount of protein in a medium-sized banana (118 g) is 1.3 g which is 3% of your RDI. At the end of the article, you will find out ways of using banana peel in your diet for its health benefits. Let’s look in more detail at the many ways eating a banana a day can help give your health a boost. Bananas are a good source of dietary fiber and so can help keep your digestion working properly. Having a large banana in the morning can help you start your day by getting 14% of your fiber intake and 20% of your required vitamin C intake. Find out about other ways to improve your digestive health naturally. If you enjoy exercising regularly, then bananas can give you a great healthy energy boost. Apart from enjoying the health benefits of bananas, find out what other great foods can give you energy. Another reason to consume a medium-sized banana before working out is that compounds in bananas can help reduce post-exercise muscle pain. Learn about other ways of getting rid of delayed onset muscle soreness (DOMS) naturally. Bananas contain a high amount of potassium and can prove beneficial in helping to lower blood pressure. Learn about other ways to lower blood pressure naturally and the importance of addressing magnesium and potassium deficiencies. If you have diabetes, you can still eat moderate portions of bananas because they can help improve blood glucose levels. If you have type 2 diabetes, learn about other foods that can help manage diabetes symptoms. Unripe plantain bananas contain compounds that can help protect your gastrointestinal lining from damage. Find out more ways to lower stomach acid levels if you suffer from ulcers or heartburn. Bananas are a very healthy fruit that can also help you lose weight as part of a weight-loss program. If you want to lose belly fat, try out some of these 12 simple tweaks for weight loss. Banana Peels: Are They Edible? Banana peels are edible and contain many antioxidants, vitamins, and minerals. So, you shouldn’t dispose of your banana peels but you can try to incorporate them into your diet. In fact, banana peels have more antioxidants than banana pulp. How can you eat banana peel? You can roast bananas along with the peel to make them more palatable. Or, you can fry them or boil them. However, if you want to get the health benefits of raw banana peel, you can chop the ends off, thoroughly wash the peel, and add the peel to your favorite smoothie. What are the benefits of using bananas peels? Here a few great reasons to use banana peel in your diet. Adding raw banana peel to your smoothies can help lift your mood and have an anti-depressant effect. For more advice on what to do if you have depression, please read this article on natural ways to lift your mood. You can also consume other supplements to increase dopamine levels and boost your mood. Banana peels also have benefits for your dental health and can help prevent gum disease. You can also try using the skin of a banana to whiten your teeth. Some people claim that potassium, manganese, and magnesium in banana peel have teeth-whitening properties. There are no scientific studies backing up these claims. However, the only way to see if bananas can whiten your teeth is to try yourself. Rub the inside of a banana peel over your teeth and leave for 5 – 10 minutes for the banana paste to work. Brush your teeth as normal to clear the banana paste and completely remove bacteria from your mouth. Use the banana skin teeth-whitening method once a day for best results. It may take a few weeks until you see results. You could also try applying banana peels to skin rashes and insect bites. All you need to do is apply the banana peel flesh side down to your irritated skin to help reduce discomfort and speed up healing. Another way to get the benefits from banana peels is to put them into your compost. Nutrient-rich banana peels in compost breakdown into their base elements and create a wonderful fertilizer for your plants. Bananas are a popular fruit that make a great snack because they are already pre-packaged in their own protective skin. How many bananas should you eat in a day to get its health benefits? You can safely eat bananas without worrying too much about overdosing. For example, one medium-sized banana contains 422 mg of potassium. According to medical sources, you need around 4,700 mg of potassium per day as part of a healthy diet. (26) That would mean that you would have to eat around 11 bananas before reaching your RDI of potassium. If you have an underlying health problem like kidney disease or diabetes, you should limit your banana intake. Most people can eat safely 4 or 5 bananas a day. Chop up a ripe banana and add it to plain yogurt for sweetness and to increase your vitamin intake. Add a sliced whole banana to your blender along with other fruits to make a delicious smoothie (see recipes at the end of this article). Boost the antioxidant levels of your smoothie by chopping off the ends of a banana and adding raw banana peel. Roast a banana in the oven to create a deliciously sweet dessert. The peel should also be soft enough to eat as well after roasting. Mash up banana flesh and spread it on some tasty rice crackers for a healthy snack. You can try to buy organically-grown bananas, although bananas have low to moderate pesticide residue score according to the Environmental Working Group (EWG) annual guide to pesticides in produce. Bananas continue to ripen in the store and when you take them home. Bananas should be stored at room temperature to ripen properly. If your bananas are about to become overripe, you can freeze them and keep them for several months. To do this remove the peel first, cut the bananas into chunks and arrange them in one layer on a parchment lined baking tray and freeze for about two hours. Once frozen, transfer to plastic freezer bag. While you cannot juice bananas, it doesn’t mean that you can’t blend them with your juice. Bananas make excellent smoothies – they add thickness and fiber to smoothies and make them taste smooth, creamy and delicious. Here I would like to share with you some great banana smoothie recipes that are great for breakfast and will provide you lots of energy to face the day ahead. Oatmeal provides high levels of fiber, has low levels of fat and is a good source of protein. It is a recommended food to control diabetes as the large amount of fiber causes a slower absorption of glucose. Almonds are rich in minerals (zinc, magnesium, potassium, iron, calcium), vitamins (E, folic acid, B1, B2, B3), polyunsaturated fatty acids, protein and fiber. They also help lower cholesterol and maintain a healthy heart and blood vessels, help lower blood pressure and strengthen bones because they are rich in calcium. This yogurt smoothie recipe combines all these nutritional benefits and is delicious too! Pour all ingredients in blender, pouring the ice in last. Blend on high for 30 seconds or until the smoothie thickens. Another great recipe is for green smoothie that combines the goodness of leafy greens and banana. You can also read my article on how to upgrade your health with green smoothie recipes. Green smoothies enable us to consume various combinations of greens and vegetables that can improve our health. The health benefits of green smoothie vary depending on the green leaves or vegetables you choose, but generally speaking they help clear toxins, add many nutrients, cleanse the digestive system, nurture the skin, improve vision, and more. And last – a recipe for cocoa banana smoothie. I’ve already written about the amazing health benefits of raw cacao, and smoothie is a great and easy way to incorporate raw cocoa into your daily nutrition. Pour the orange juice and all the other ingredients into the blender and blend. If you want you can add more juice or water to thin the smoothie. Does banana leads to constipation? I have read that bananas can cause constipation when you eat them before they are fully ripe and when you eat a lot of bananas without drinking sufficient water. In order to prevent constipation you need to eat them when they are fully ripe and drink your daily recommended eight glasses of water a day, so that the fiber in the bananas will enable healthy bowel movements. Theres so many kinds of bananas, are all of them have the same benefits? There are hundreds edible varieties of bananas, but they fall under two distinct species: the sweet banana (Musa sapienta, Musa nana) and the plantain banana (Musa paradisiacal).Sweet bananas vary in size and color, and this type includes the majority of the bananas grown in the Western Hemisphere. Plantain bananas are usually cooked and considered more like a vegetable due to their starchier qualities and they have a higher beta-carotene concentration than most sweet bananas. So it’s not exactly the same benefits, and there might be variations according to the specific specie. But I guess what we are looking in all the nutritional fact charts belongs to the sweet banana type. what about pesticides as bananas are sprayed for travel & shipped. Also I have never heard of Cavendish banana (Musa acuminate). Where do you find them to buy? Hi Cam, as mentioned in the article, bananas have low to moderate pesticide residue score according to the Environmental Working Group (EWG) annual guide to pesticides in produce. But you can always opt for organic produce. Cavendish banana is also called William Banana. Every supermarket or fruit & veggie shop have different produce so you will have to check the product label.